Rising young Central Districts trainers Cameron Crockett and Clint Lundholm have singled out their strongest preferences from numerous leading contenders throughout Sunday’s Dubbo TAB meeting. Crockett’s profitable association with Mathew Cahill, a close third behind prolific Greg Ryan and Ben Looker in the Country Jockeys premiership, provides the strongest lead for punters on a seven-race program with capacity fields. Crockett, with a healthy 17 per cent winning strike rate this season, is producing several unraced triallers in maiden events. In the opening race, Men Of League Maiden (1100m), Crockett has a high opinion of Fame And Fortune, a three-year-old Pluck (USA) filly to be ridden by Cahill. “Really impressive filly, we’ve certainly got expectations of her, she’s shown us way above average ability at home - she’s well forward,” Cameron enthused. Fame And Fortune has drawn comfortably in barrier eight with 57kgs for Cahill in a capacity field. Cameron is also upbeat about the chances of last start Dubbo winner Reprimand, also to be ridden by Cahill, in the Blue Elephant Class 2 (1000m). “I usually avoid a quick back up for short course sprinters, but she’s thrived since she won at Dubbo and mares hold their form,'' he said. “She led and put a space in them. And the time she ran suggests she can progress through the grades. Lundholm, with regular winners at tracks in proximity to his Dubbo base, is confident his performed sprinter Joey’s Destiny, fourth in their regional Country Championships leg, can regain winning form in a Lifeline 131114 BM 65 (1000m). “He’s back to his right distance range and back in grade, we tried to stretch him out to 1400m for the Championships, but he just doesn’t run it in that class,'' Lundholm said. 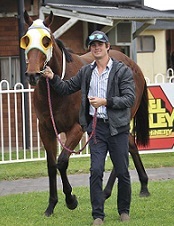 “And he was probably too fresh when he led and over raced in that Digger’s Cup at Narromine. But he’s had a let-up, I’m happy with him. He’s won four around this distance range and thrives at home. “I’ve got Fire Flight in an earlier race, she’s a progressive mare in winning form, but will need luck from the wide draw. Dubbo at present is rated a good four with fine weather predicted.